Government officials have agreed to conduct a joint march with far-right organizations to commemorate Poland’s Independence Day, raising concerns that the ruling Law and Justice party is legitimizing fascist viewpoints. 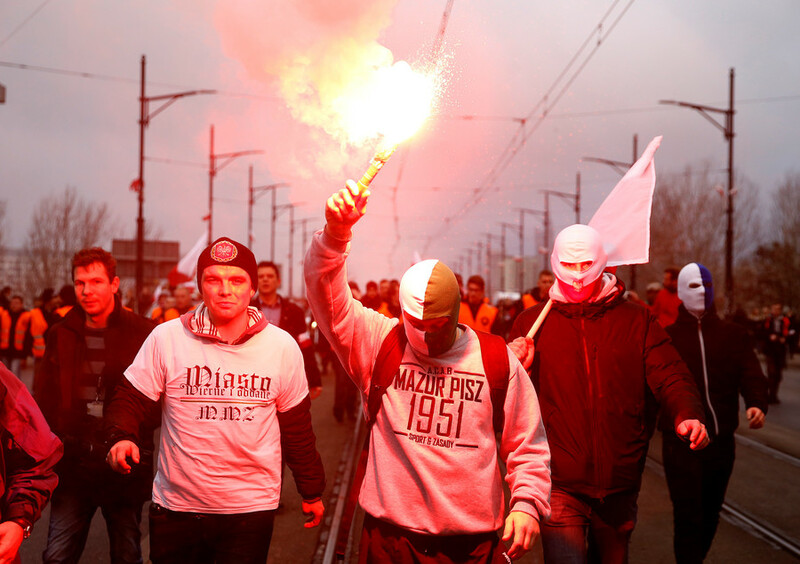 Since 2009, the celebration of Polish Independence Day has become a rallying point for far-right organizations from all over Europe, some of which openly describe themselves as fascists or Nazis. This year marks the centenary of the country’s independence, an occasion which has drawn massive crowds. Last year, the march attracted 60,000 people, making it the largest far-right gathering in the world. The event included explicitly white supremacist symbols and banners with slogans such as “White Europe” and “Refugees get out!” The rally was cited in a European Parliament resolution that encouraged member states to crack down on far-right groups, but the leadership of Poland seem to have other plans. There was a last-minute attempt by the mayor of Warsaw to ban the march, but a court overturned his decision and allowed the event to go ahead – despite the fact that months of negotiations had failed to result in any agreement on key arguments between the state and representatives of the rally. The final negotiations took place late on Friday night. The demonstrators were represented by Robert Bakiewicz of the National Radical Camp, an anti-Semitic group that traces its roots to an organization from the 1930s founded on the principles of Italian fascism. The Polish leadership not only backtracked on its earlier position that the march could only take place if no banners were displayed, but now both the president and prime minister agreed to actually participate in the march. Prime Minister Mateusz Morawiecki was recently involved in a scandal after secret recordings from 2013 were released, featuring him making anti-Semitic remarks. If this was not enough to worry the citizens of Warsaw, the Polish police are currently on strike, and have stated that they will not be able to provide security for the event. While the Polish government has struggled with these groups in the past, the country has become a crucible for the European far-right in recent years, and Friday’s unprecedented agreements are sure to stoke the flames even more.